Just for the record, I never really was much of a death metal fan – historically speaking there's been far too much directionless riffing (aggression is fine if it's focussed, just look at some of the thrash bands) and tuneless grunting ('singing' would probably breach the Trades Descriptions Act) for my tastes. Of late however the genre has been undergoing an, at times, rather startling metamorphosis. More and more bands from all corners of the rock and metal universe have injected a shot of death metal into their pantheon of influences (often to great effect), and with the likes of the technically brilliant Children Of Bodom proving without doubt that the songwriters craft is starting to take hold, even cynical old farts like me are having to take note and reassess ... and then along came Amaranthe. Given the big budget movie feel of the promo video which accompanies lead single (if such a beast still exists) 'Hunger', it would appear that Universal has big plans for this lot, and it's easy to see why. Admittedly the rather obvious charms of chanteuse Elize Ryd are an obvious focal point (at least initially ... she certainly got my full attention! 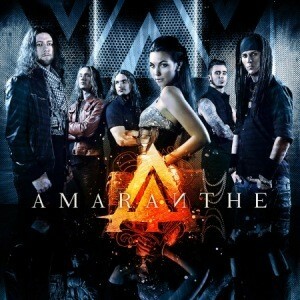 ), but if you delve a little further there's actually so much more to Amaranthe than a cute chick in a short dress! Originally called Avalanche, this Swedish/Danish power/melodic death metal sextet first came to prominence a couple of years ago via a four song demo which soon had a string of record companies clamouring for their collective signature. The band grew from an idea shared by guitarist/keyboard player Olof Morck (Dragonland, Nightrage) and vocalist Jake E Lundberg (Dreamland), their aim to take the music of bands like Soilwork, Meshuggah and Mnemic and to present it in a fresh, commercially more accessible setting. Intense, yet surprisingly catchy, the contrast between the clean vocal styles of Elize and Jake and the growls of Andy Solvestrom (Within Y, Evildoer) makes for compulsive listening, as between them they turn the standard melodic power metal model on its head. Pulling in elements of everything from the bands already mentioned to Nightwish, HammerFall and the like (not to mention the odd nod to a genre or two not normally readily associated with our particular area of interest – I'll let you discover those for yourselves! ), Amaranthe have seriously nailed it, and with this self titled debut as a battle standard should lead the charge right into a much more mainstream consciousness. Beyond the infectious 'Hunger' already mentioned, tracks such as 'Leave Everything Behind', 'My Transition' and the awesome 'Director's Cut' have everything you could want really – incisive guitars, a great sense of theatrical melodrama, strong melodies, and an intense energy that should really knock your senses for six on stage. Factor in a bold and dynamic production on top of that and ... well you get the picture. As I said at the beginning of this piece, I never was much of a death metal fan but if this is the shape of things to come that might just change.